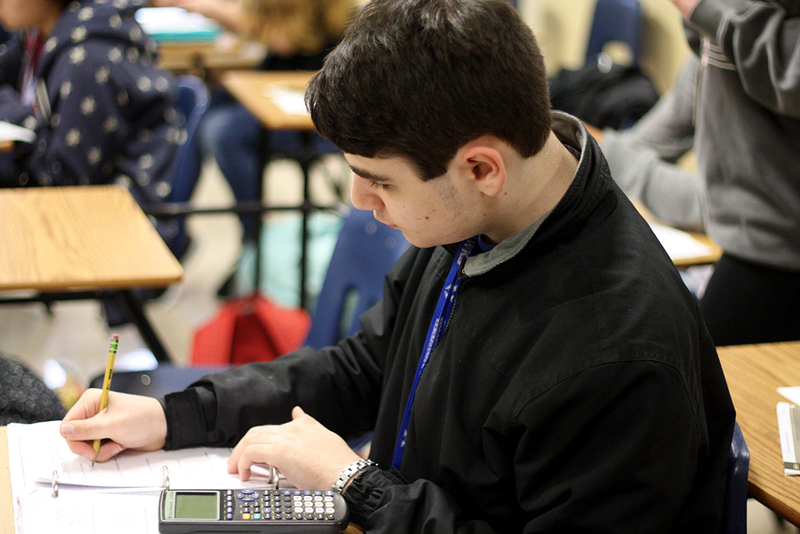 Junior Elliott Saltar works on an assignment in his chemistry class. He has been in all general education classes since he was a sophomore. Junior Elliott Saltar has Autism: Asperger Syndrome, to be exact. Diagnosed with Asperger’s, a developmental disorder affecting communication and ability to interact socially, in 2007, Elliott has faced and overcome challenges throughout his life. Elliott takes all general education classes and has learned to deal with both Asperger’s and Obsessive Compulsive Disorder (OCD). Elliot’s move from the special education classroom to the general education classroom is just the latest example of his tendency to exceed expectations, despite the obstacles he’s faced. For example, his ongoing passion for technology began when he was three and he received his first computer. And when he was four, he taught himself to read. Elliott’s parents began to suspect something was wrong when he was in preschool. As a child, Elliott showed early and common symptoms of Autism, such as lining his toys up and organizing them rather than playing, banging his head against a chair and stimming, which is a repetitive self-stimulating behavior. Michael said he prefers to treat Autism as an injury rather than a disorder, and believes it can be reversed, although the process is difficult. Treatments are too experimental for insurance to cover, drug manufacturers are protected from being sued and treating Autism is expensive for the average person. With what treatments they could try, Michael feels that they have helped Elliott. But when Elliott was in second grade, something happened: mercury poisoning. The maintenance crew happened to be changing the fluorescent light tubes in the hallway ceiling, and placed them near Elliot’s classroom. An accident occurred, and they fell over, shattering. Fluorescent light tubes contain a small amount of mercury, which diffused into the air. Elliott and one other student in his class were directly affected by the mercury in the air. His family noticed a significant change in Elliot as a result of the toxicity in his brain. Elliott stopped talking for six weeks. He became, as Michael puts it, “profoundly autistic.” They did not know if his voice would ever come back. After treatments and therapy including salt baths and ingestion of natural herbs, their prayers were answered. From his time at Homestead Elementary to high school, Elliott had been in special education classes. Elliott was able to gradually work his way out of BIC (Behavior Intervention Classroom) by the end of freshman year. During the beginning of freshman year, Elliott was in BIC full-time because he was severely OCD and would experience getting stuck. Isom and Elliott were able to find the trigger for getting stuck, which was a lack of sleep. Once Elliott was able to control the issue and communicate with his peers and teachers about getting stuck, they knew he was ready to leave the special education setting. Elliott said his OCD probably has a correlation with Asperger’s. Since the beginning of sophomore year, Elliott has been taking only general education classes and has an aide check on him for 15 minutes a week. He also has speech therapy every week. Elliott feels that the Autism label hasn’t really had too much of an impact on him; however, he would dislike if someone put him on an unequal level because of it. Many people have helped Elliott along the way, including his parents and special educational teachers.